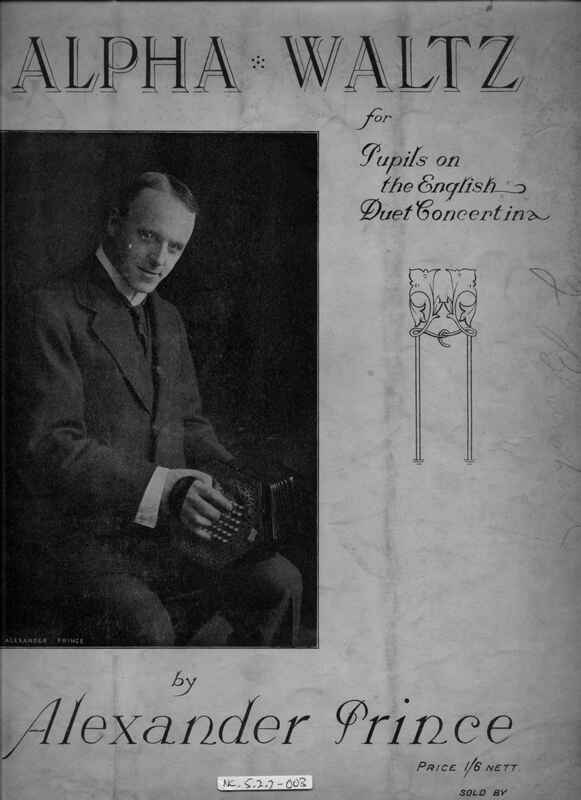 Full Description: One of a series of large folio music pieces by Alexander Prince, the Duet concertina virtuoso. This piece is “The Alpha Waltz - for pupils on the Duet”. Marked “AP 1” and “copyright 1921 by Alexander Prince, 29 Glebe Street, Nottingham”, and is over stamped as sold by “Wheatstone & Co, 15 West Street” and has the inked Wheatstone Number 2523 added to the cover. Neil Wayne visited Prince’s brother at the Glebe Street premises in the late 1960s, and viewed many old photos of Prince. The cover has a fine photo of Prince seated with a six-sided Maccann Duet with broad ivory buttons. Prince self-published these pieces to sell to his pupils and to others, and other copies are over-stamped as being sold via Wheatstone’s West Street premises. 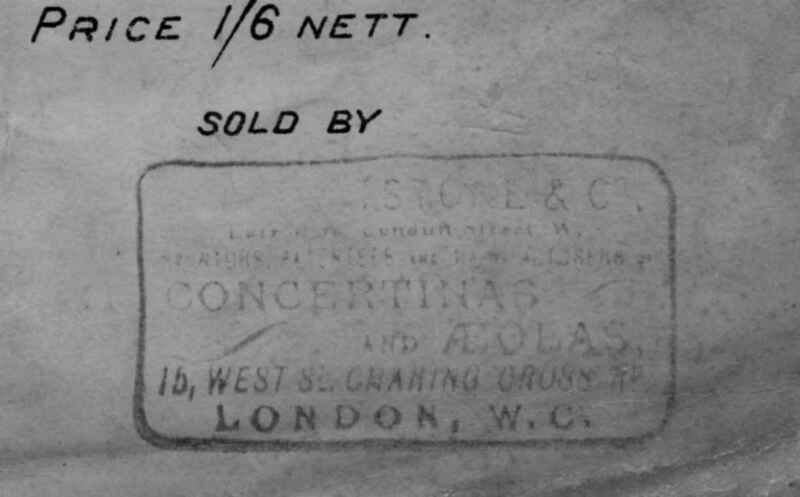 See also items NC.5.2.2-001 , [http://www.concertinamuseum.com/NC50202-001.htm] NC.5.2.2-002 , [http://www.concertinamuseum.com/NC50202-002.htm] NC.5.2.2-004 [http://www.concertinamuseum.com/NC50202-004.htm] and NC.5.2.2-005 [http://www.concertinamuseum.com/NC50202-005.htm].